Too Cute Cupcake Cake - The newest addition to Baskin-Robbins’ lineup of birthday cakes is an oversized cupcake filled with delicious ice cream and cake that is sure to make any birthday more fabulous. 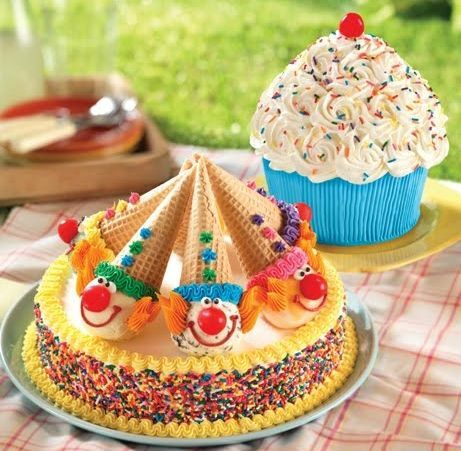 Clown Cone Party Round Cake - This happy cake is adorned with Baskin-Robbins’ classic Clown Cones and sprinkles around the edge. Each Clown Cone can include a scoop of the guest’s favorite ice cream flavor, while the inside is filled with the guest’s choice of ice cream and cake flavors. Baskin-Robbins is also offering guests OREO®-inspired frozen treats to help guests cool off throughout August. Baskin-Robbins’ OREO® Nutty Salted Caramel Layered Sundae is made with three scoops of the August Flavor of the Month, OREO® Nutty Salted Caramel, caramel praline sauce, hot fudge, chopped OREO® cookie pieces and whipped cream. For another delicious indulgence, guests can enjoy the new OREO® ‘N Caramel 31 Below made withsmooth and creamy vanilla soft serve blended with chopped OREO® cookie pieces and caramel topping. Baskin-Robbins also has two special in-store offers to help guests stay cool this summer. As part of its new Soft Serve Slingshot Promotion, guests are encouraged to visit http://softserveslingshot.com/ or the Baskin-Robbins Facebook page and vote for their favorite topping to receive a coupon for a “Buy One, Get One for 99 cents” 31 Below soft serve treat that can be used at participating Baskin-Robbins shops nationwide until September 30, 2013. 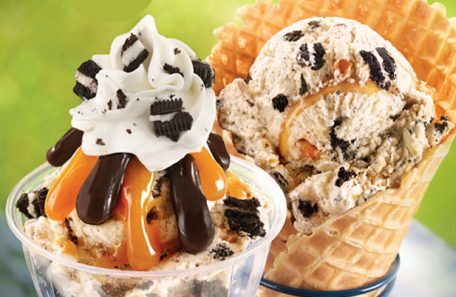 In addition, continuing through the month of August, Baskin-Robbins is offering guests a free freshly-baked waffle cone upgrade with the purchase of a double scoop of Baskin-Robbins ice cream.